The registration process will open a new window in your browser and direct you to the registration site. 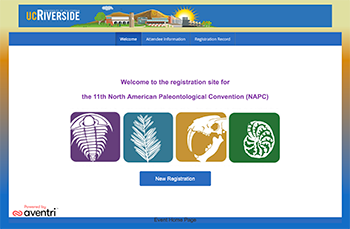 Online registration for NAPC 2019 can be accessed here starting Monday, January 14. At the registration site you will have the opportunity to register for the meeting, field trips, workshops and other opportunities, to reserve on-campus housing at UCR, and make arrangements for any guests that are accompanying you. Registration modifications are not allowed. All selections are final once payment has been processed. We are offering several exciting regional field trips planned for before and after the meeting, as well as field trips and workshops on Tuesday, June 25, when we will take a one-day break from formal meeting sessions. Field trips and workshops are described here. Registration for the field trips (requiring additional fees that cover transportation and meals) and workshops (no additional fee, except for those occurring at the Natural History Museum of LA County) is available at the online registration site. Space is limited, so please register early! Field trip spots are currently reserved for full paying participants. However, if your guest would like to go on a field trip, please email NAPC2019@ucr.edu to put your guest on the waitlist in case the field trip does not fill or we add additional vehicles. Be sure to say what field trip it is! We welcome spouses/partners and families, and have several activities planned just for them! Guest registration is $150 per family group for the meeting, but specific special event costs are per person. For example, when registering a spouse/partner and two children as guests, with only one guest attending the banquet but all three guests going to Laguna Beach, you will be charged a flat $150 fee for guest registration, and should type “1” into the “banquet for registered guest - $50 per item” box, and “3” into the “family excursion: Laguna Beach- $30 per item” box. Guest costs for this family would be $290 which is (150 + (50x1) + (30x3)). Please also keep guests in mind if you are reserving on-campus housing, and make sure you have reserved enough single beds to accommodate everyone. Because of the size of the meeting, we do not have child care options. There will be a lactation room available. Attendee registration includes conference materials, coffee and tea breaks, lunches and dinners (including the final banquet). Accommodation at Glen Mor will include breakfast. Late registration fees apply starting Saturday, March 2 and online registration will close at 23.59hrs PST Monday, May 15. On-site registration will also be available. Students, thanks to NSF, we have a limited number of travel grants available for U.S. domestic students! See the students page for more details. You will have the opportunity to reserve on-campus housing during the registration process. On-campus accommodations are apartments consisting of 4 rooms with a single, twin bed in each room and two bathrooms. If you do not indicate who your roommate(s) will be, we will fill your apartment with other attendees based on the preferences you provide during registration. There are a limited number of on-campus rooms available. We have also blocked off rooms at two local hotels that you can reserve separately.